It’s Day 4 and the second week of DA Weddings’ March Guest Blog Campaign! Enjoy as Neli Prahova of Neli Prahova Photography takes us to Italy’s Amalfi Coast! And don’t forget your Twitter hashtag: #daweddingsmgbc. Amazing seafood, incredible pizzas, limoncello liquor and buffalo mozzarella—these are often among the charms of Italy. But when you add romantic little streets, Italy becomes the appealing place not only for tourists, but for couples choosing to get married abroad in a destination wedding in Italy. Sunshine, stunning ocean view vistas, and the eternal blue sky are among the right ingredients for a perfect wedding day. And nowhere are the oceans views more stunning than in Amalfi Coast. Amalfi Coast is something you have to see and experience yourself. The breath-taking main square of the town of Amalfi is an idyllic setting for creative wedding photography. The amazing cathedral dominates the entire town with its imposing stairs and panoramic views. Everywhere you turn there is an impossibly blue sea. The nearby enchanting Isle of Capri is only a boat ride away and is also famous for a destination wedding in Italy. However, Positano is the heart of the Amalfi Coast. The town is surrounded by magnificent coastline, white Moorish-style houses cling to the flowering cliffs. Everywhere you look there are bright bursts of purple and red bougainvillea flowers. And Positano is where this beautiful young Japanese couple decided to celebrate their wedding among close family. The couple contacted me via Rieko who is the Director and Wedding Planner in Italy of the Le Maestro wedding planning agency. Based in Tuscany, Rieko is a master in organizing destination weddings all over Italy, France and UK. I have already worked with Rieko as a wedding photographer in Cotswold for one of her clients who got married in the U.K. and I was thrilled to be commissioned the wedding photograph in Italy for another client. 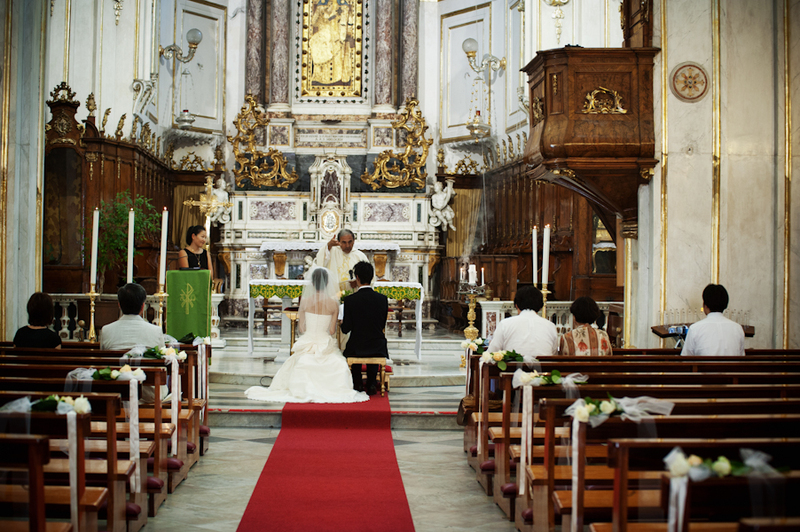 Most Japanese couples getting married in Italy have only civil ceremonies; however, this couple was Catholic so there was a civil ceremony as well as a church ceremony. The civil service ceremony took place in Positano City Hall which is perched high above the town and provides a stunning view of the Italian coastline. The ceremony was conducted on a small balcony with an aromatic sea view which was the perfect location for some wedding photography with Positano’s colourful houses in the background. The church ceremony took place thereafter at The Cathedral of Santa Maria Assunta which is one of the finest churches on the Amalfi Coast. Following the beautiful intimate Catholic ceremony the couple and the family got some exquisite canapés and champagne at Hotel MURAT. In the centre of Positano, tucked away in a botanical garden, hidden among tiny, sunny roads full of flowers this hotel used to be an eighteenth century palace. And what a location the wedding planner has chosen–the beautiful botanic garden was directly facing the doom of the Cathedral which was a perfect backdrop for some beautiful wedding photography in Positano. Following the cutting of the cake, the newlywed couple, myself and the Japanese stylist embarked on an hour-long adventure of wedding photography on the cute little cobbled streets of Positano. For couples getting married in Italy, this is a very romantic place. For wedding photographers Italy is the Mecca for a destination wedding photography. However, when the wedding takes place in the middle of the day in a busy touristic town like Positano, it’s not always so easy to get those romantic photos that one captures when photographing a wedding at a venue exclusively rented by the couple. So often it makes sense to just incorporate the hustle and bustle of the streets as part of the photos. The fact that the wedding was right in the middle of the day meant harsh direct sun, but the positive side was that the square in front of the Church of Santa Maria Assunta in the centre of Positano was pretty empty and allowed for the lovely wide angle photo of the couple and the church. However my favourite photos are the ones on the bright red wall. I believe it turns the photos into this creative wedding photography with a touch of glamour. I was certainly flattered when the wedding planner told me that the couple was so pleased with the photos that they asked their Japanese wedding photographer who photographed their wedding back in Japan to recreate some of the photos from my wedding photography in Amalfi coast. It is always a privilege to be chosen as a wedding photographer for the couple’s wedding, but I really feel honoured when a couple requests my services as a destination wedding photographer. And you can’t ask for more when you do a destination wedding photography in Amalfi Coast Italy–one of the most romantic places to marry abroad.